If you are looking for the home gym and want to know more information about it, then you’ll LOVE this guide. We have done the legwork for you and handpicked the All-in-one Home Gym on the market. With living in such a fast paced society, it is no wonder why many people have such a hard time getting to the gym on a regular basis. Home gyms offer the power of a health club workout in the convenience of your own home. You will be much more motivated to work out if you simply have to travel to the basement or office as opposed to driving to a gym. You could even get a quick, effective workout in while watching your favorite TV show! Convenience is key to developing an effective workout routine, and having the best home gym is a great way to obtain that exercise convenience. Gym memberships can be expensive and often times you are paying for services that you may not even use. Though a home gym might be an upfront cost that is more than a monthly gym membership, you will make up for it in the long run. By investing your money in a home gym you will save on gas and membership fees that would far surpass this affordable piece of equipment. You will still get a great workout and will be able to save the difference. One of the final reasons to purchase a home gym is the fact that it provides you with total privacy to complete your workouts. Many individuals are not comfortable with going to a gym for fear of comparisons with other members. You can be confident in your body and in your workout plan. Blast your favorite music and wear your favorite workout outfit without fear of anyone’s judgment. You will be free to focus on your fitness goals in the comfort and privacy of your own home. There are three main categories that home gyms fall into. Weight stack gyms, free weight-plate loaded styles, and resistance rod styles all offer different features for users. 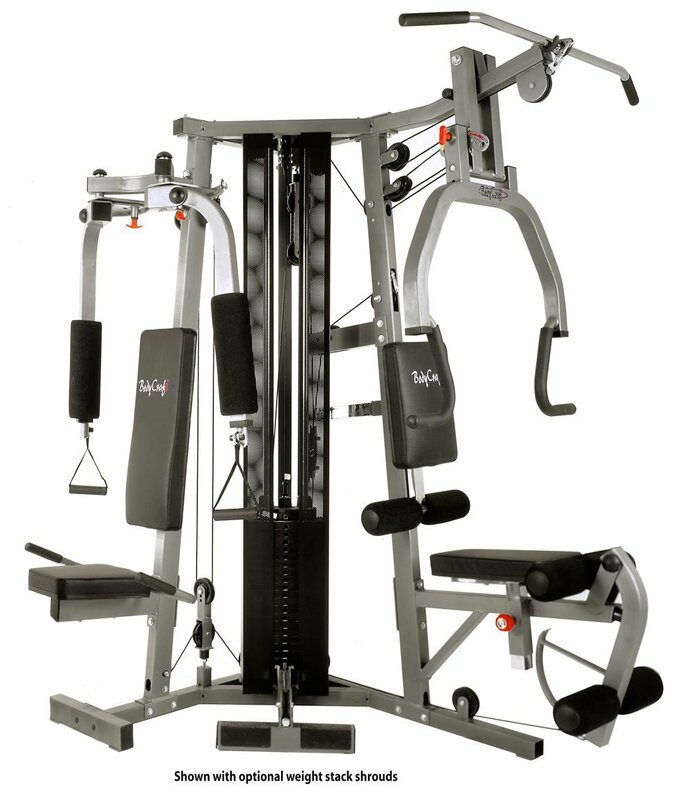 Weight stack are the traditional style of gym that you are used to seeing at many fitness centers. They contain one main stack of weights that can be adjusted typically by moving a pin into place for your desired amount of weight. Some advantages to this type of system are that it is the most compact, it is very safe to use, and it offers a wide variety of exercises that work a variety of parts of your body. Free weight are also often called multi-gyms and feature several stations connected together that each work different areas of the body. You must manually add weighted plates to the station that you are working at in order to increase resistance. This type of workout simulates a free weight lifting session, which may be desirable to some users. The next category of is resistance rod styles. This type of home gym uses rods or bands of different tensions to simulate to resistance felt when lifting weighted plates. This type of system is very compact but does have the ability to lose resistance over time and can be uncomfortable to use. Finally, there are several brands of home gyms that utilize your body weight as the sole form of resistance. By increasing or decreasing your angle on a moveable bench, you will increase or decrease the amount of resistance that you are pulling. These are usually very affordable models, however some users have mentioned that the weight resistance is not enough for their fitness goals. There are many things that you should consider before purchasing. Paying close attention to items such as cost, size, storage options, and number of exercises will lead you to find the perfect piece of equipment for all of your exercise needs. It is likely that you will be investing a large amount of money into your home gym, but you need to make sure that your purchase fits into your budget before breaking out your credit card. There are a wide variety of price ranges for home gyms depending on whether you want a resistance rod style, a gym that is strictly for home use, or one that is durable enough to be used in a commercial setting. Make sure to set a maximum budget for your purchase and don’t go over it! Home gyms can be a great way to save money if you stick within a reasonable price range and look for a piece of equipment that has what you need but won’t break the bank. Keep in mind the location in which you will place your new equipment once you set it up. Some gyms can take up a substantial amount of room while others are relatively compact. It is a good idea to measure the size of the space and write down the dimensions to take with you when examining products to purchase. That way you will know for sure that your new piece of equipment will fit comfortably into the spot you have designated for it. If you live in a compact space such as an apartment or townhouse, having a home gym that folds for easy storage might be a huge selling point for you. Some brands fold easily while others are much more stationary. Make sure to ask about whether or not the unit folds and also be sure to inquire about its folded up dimensions. As with the above consideration, it is important to take the dimensions of your designated home gym space with you so that you know if the equipment will fit. Many home gyms offer a variety of workouts for various parts of the body, but some do offer more variety than others. Consider whether you want to invest more money into a home gym that offers more options or if you are comfortable with a more limited amount of exercises in order to save some money. Make a list of essential body parts that you want to be covered through this machine and keep those in mind as your essential requirements. Anything above and beyond is great, but not if it makes the price too high! 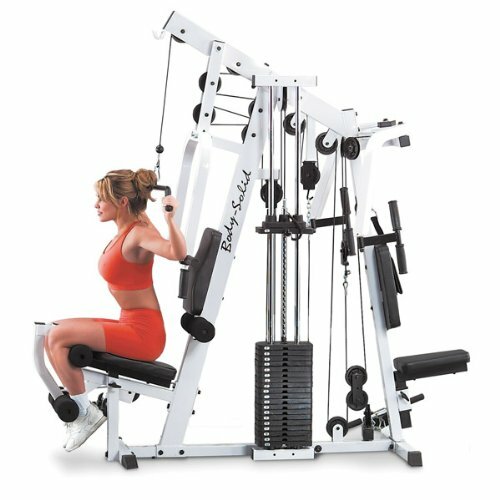 Many home gyms strengthen your body using different techniques. One gym, for example, might offer bicep curls as an arm workout, while another offers tricep kickbacks. Make sure that the types of exercises offered coincide with your fitness goals and abilities. If a home gym offers exercises that you aren’t able to do due to an injury, it doesn’t make sense to make the purchase! Find a home gym in which you can perform all of the exercises safely and effectively to ensure the best possible workout for your money. The amount of resistance on home gyms is a huge consideration to think about before making your final purchase. Keep in mind not only the amount of weight that you can currently lift, but also the project amount of weight that you will be able to lift as you get stronger and in better shape. If you are lifting almost the maximum amount of weight on a home gym as you are considering its purchase; that is a sign that you will soon out grow the machine. Look for models in which you can add additional plates so that the equipment can grow with you as you improve. Many of these machines have a weight capacity that limits the amount that the seated benches can hold safely. It is important to make sure that you fit comfortably within the weight limit of these machines. Choosing a machine in which you exceed the weight limit might not seem like a big deal, but it can lead to equipment malfunctions or even serious injury. It is also important to consider all of the individuals who will be using this machine. If you comfortably fit into the weight capacity but your spouse does not, make sure to purchase a home gym that is suitable for you both. Many are built with individual use in mind, but there are some that are much more durable and suitable for commercial use. These usually are more expensive but have the ability to last a much longer time and sustain much higher impact and use than equipment designed solely for home use. Also consider the amount of assembly and directions involved with setting up your home gym. If there is extensive assembly required, it might be a good idea to pay for a company to set up the machine for you. Just make sure that you have the home gym in its final resting spot before you have it assembled. These machines will often be too heavy to move once they are fully set up. Finally, it is a smart financial idea to ensure that your home gym comes with a reliable warranty in the event of a product malfunction. Companies should offer a warranty on the frame, parts, and labor to some extent. If no warranty is listed with the product, ask customer service for details on any that are available for purchase. With a product such as this it might be a good idea to invest in an additional warranty to avoid any unnecessary repair bills should you encounter a problem. There are many different models on the market today, each with a variety of features, benefits, and possible drawbacks. It is important to thoroughly review many different types so that you are confident in your final purchase. 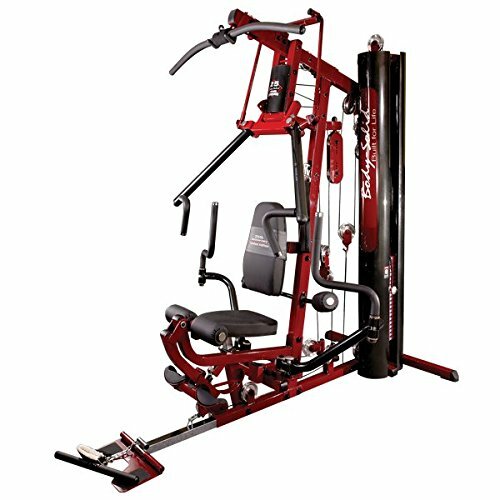 Features: The Bowflex PR1000 offers you a rod resistance workout that can be achieved quickly and conveniently in your own home. It features a sliding seat rail for cardio row training, 210 pounds of power rod resistance, and a 300 pound user weight capacity. In addition, this machine offers a wide variety of exercises and folds for easy storage. It is priced for sale at $449 and comes with a manufacturer’s warranty that covers the frame, rods, and parts. Pros: There are many advantages to purchasing this type of fitness equipment. First, the rod resistance system makes the gym much more affordable than commercial varieties. The $449 price tag is extremely reasonable when you consider that you would pay near $1500 for a commercial home gym. 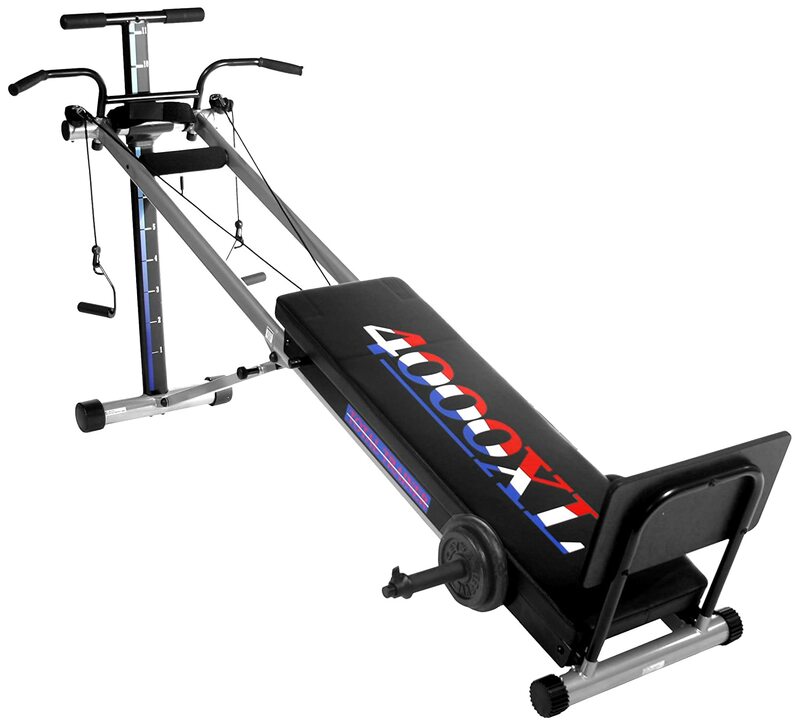 Additionally, the Bowflex PR1000 offers more than thirty exercises that you can complete using this one simple machine. You can work your arms, legs, back, chest, abdominals, shoulders, and much more with a wide variety of exercises. Finally, the built in cardio rowing machine adds the element of a great cardio workout to this piece of equipment, making truly a total body experience. Cons: Though there are many advantages to the Bowflex PR1000, there are a few drawbacks that should be noted. First, there have been several customers that have mentioned the power rods lose their resistance relatively quickly. They do fall under a five year warranty, so make sure to call customer service if you notice a problem. Additionally there have been a few customers that have commented on the fact that changing the cables to accommodate each type of exercise can be cumbersome and confusing. Features: For an extremely affordable price, this total body home gym offers several features including an adjustable incline bench, resistance bands for increased weight, and a compact space-saver design. Different from many other types of home gyms, Weider uses bands and your own body weight to add or lower the resistance that you are lifting. There are no plates, pins, or rods on this machine. 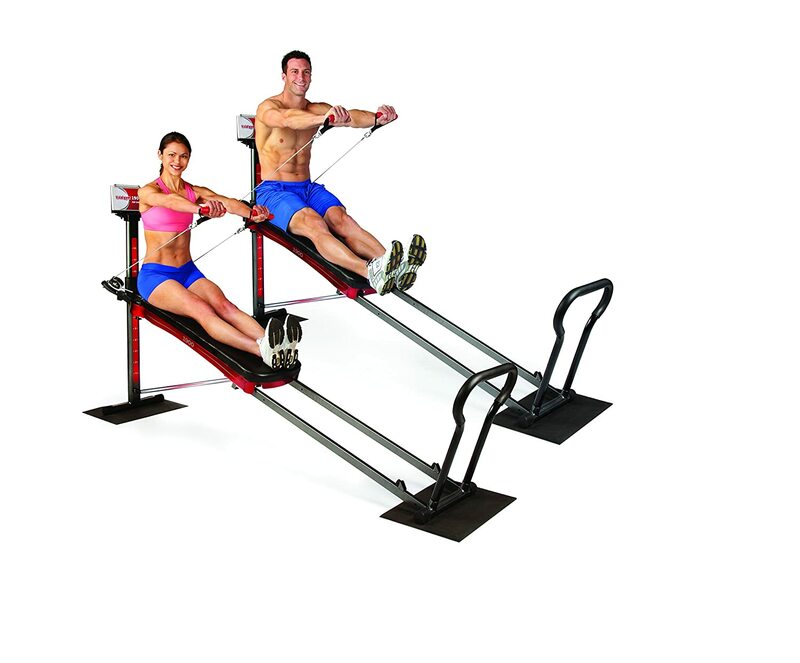 Simply adjust the incline of the adjustable bench to add more resistance. 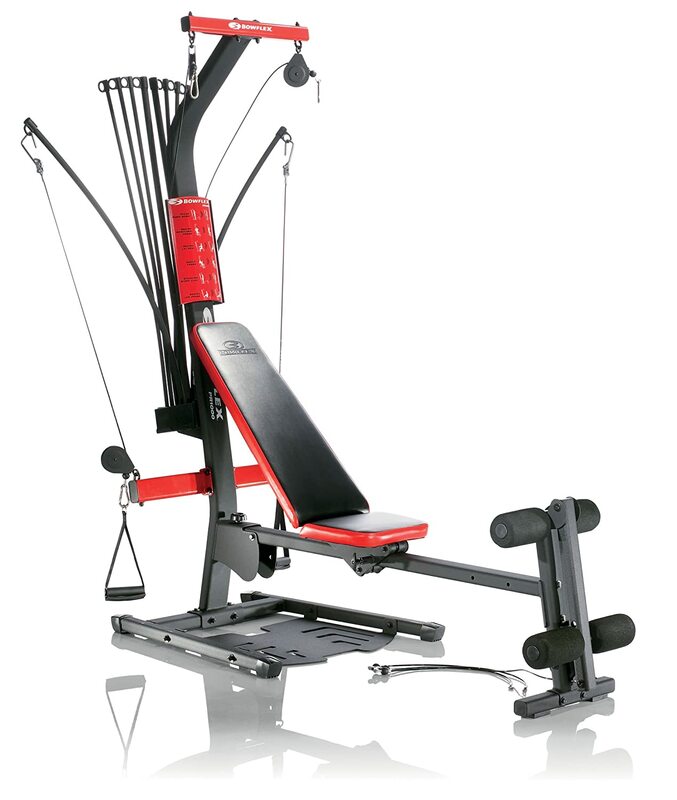 Pros: One of the advantages to the Weider Ultimate Body Works is the fact that it is incredibly affordable. For an investment of under $200 you can have a total body home gym experience in the comfort and privacy of your own home. In addition, its cable and pulley system allow for a much greater range of motion than does traditional lifting. Finally, the Weider Ultimate Body Works has had many customers mention that it is built durably and can sustain a heavy amount of use without malfunctioning. Should anything break on this machine, however, there is a 90 day manufacturer’s warranty that is included with your purchase. Cons: There have been several customers who have commented on the fact that the instructions to assemble this machine are confusing and very detailed. Make sure to set aside ample time to put your home gym together to avoid frustration. Another possible drawback is the fact that a few reviews mentioned the cables being too long to provide an effective workout. You should always try this type of machine out before committing to make sure that the amount of resistance is appropriate for your fitness goals. Verdict: The Weider Ultimate Body Works is an extremely affordable option if you don’t have a lot of resources to spend on an expensive setup. It will fit nicely in compact spaces and offers a nice range of motion due to the cables and pulley system. 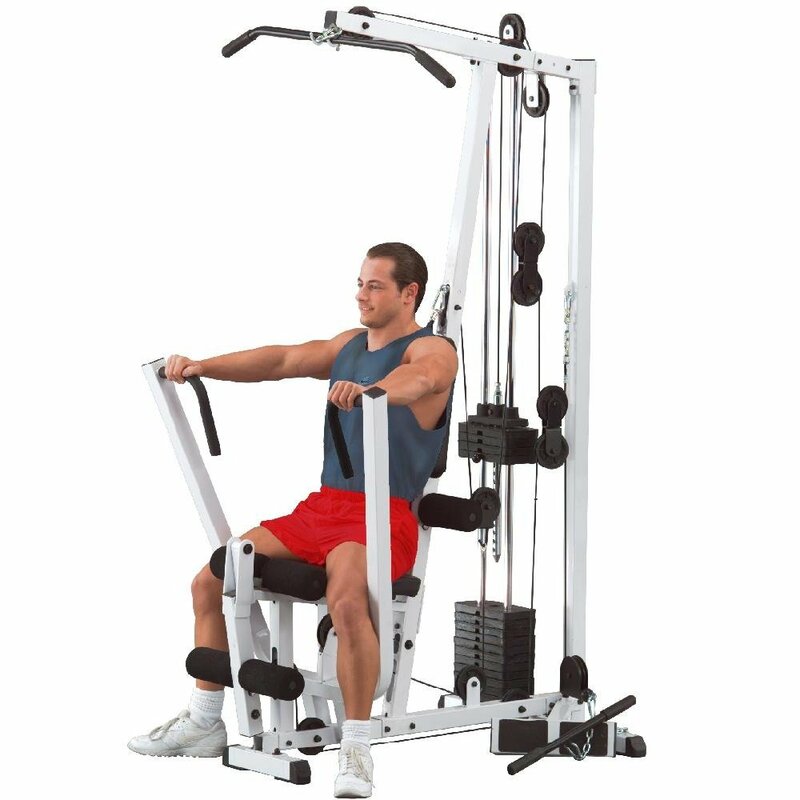 It is important, however, to set aside enough time for you to assemble this machine and make sure that the resistance cables offer the type of workout that you are looking for before making your final purchase. 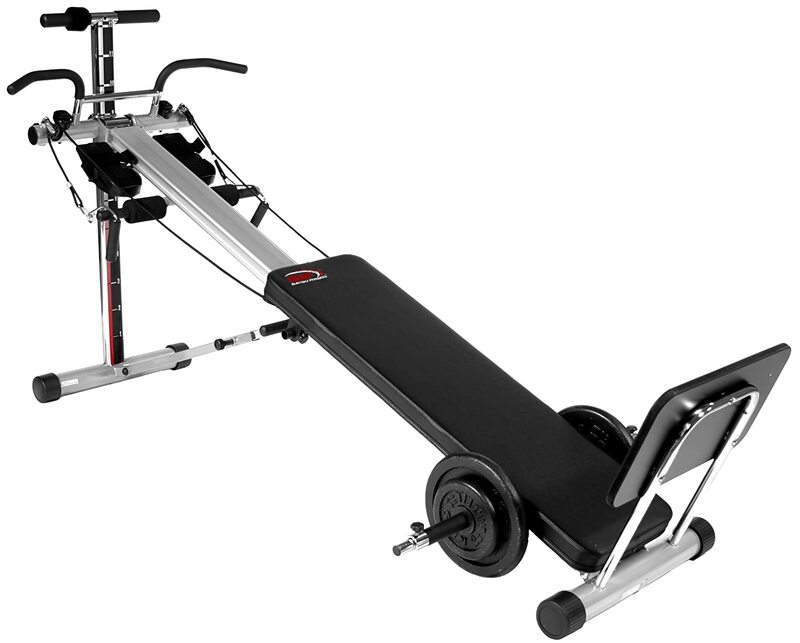 Features: Total Gym XLS Trainer offers a comprehensive workout in a quick and effective format. 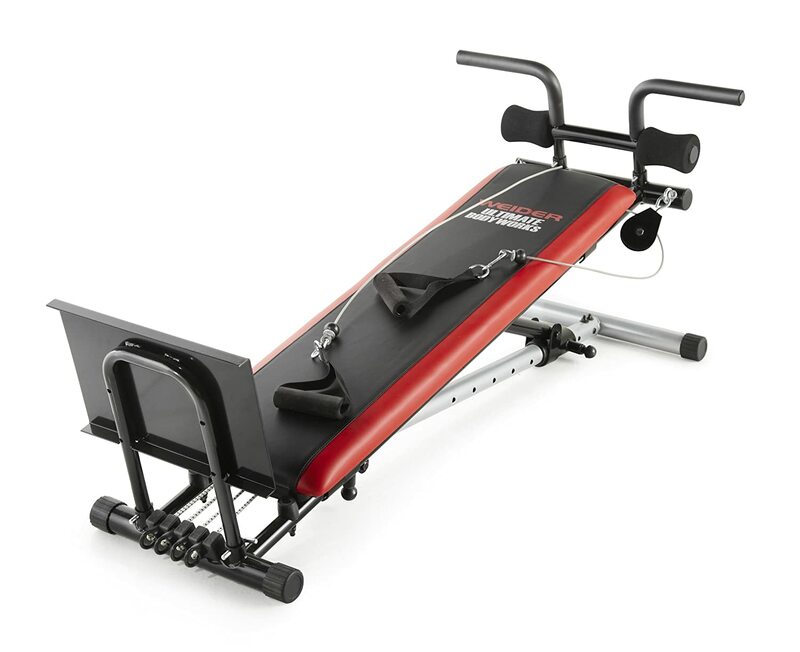 This machine features a single glide board and several attachments that encourage you to lift a percentage of your body weight as resistance. As with the above model, resistance is increased as the incline of the bench is increased, making it necessary for you to lift more of your body weight. 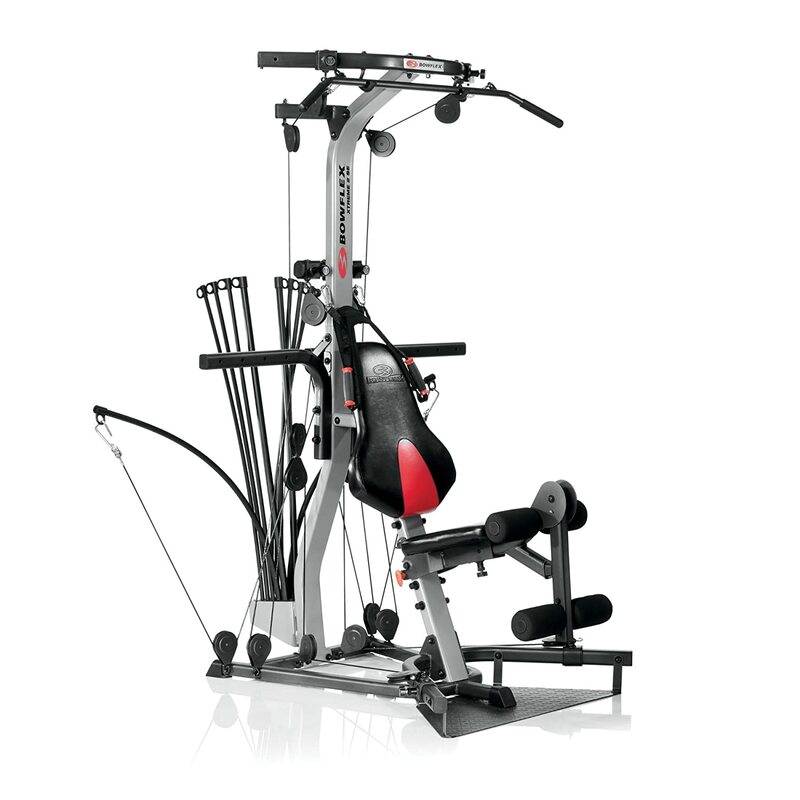 The Total Gym XLS Trainer is priced at $732 and features a variety of workout DVDs that are include with its purchase. Pros: One of the major advantages with this product is the fact that it comes with so many instructional DVDs. You can be sure that you are completing the exercises in the most effective, efficient, and safe manner by following along with professionals. This machine also has a weight capacity of 400 pounds, which is significantly higher than other models. This weight limit allows users of all fitness levels to reap the benefits of the Total Gym. Finally, the Total Gym XLS offers over 80 exercises that you can do to increase your fitness and overall health. With that much variety, there is truly no need for a gym membership! Cons: One of the drawbacks to the Total Gym XLS is its price tag. At $732, this is significantly more expensive than other pulley and cable system models, though you are likely paying for its durability, wide variety of exercises, and accompanying instructional DVDs. There were also a few customers who mentioned the increased likelihood of shoulder injuries due to the larger range of motion that this machine provides. Make sure to follow the instructional DVDs carefully to avoid any injury on this machine. 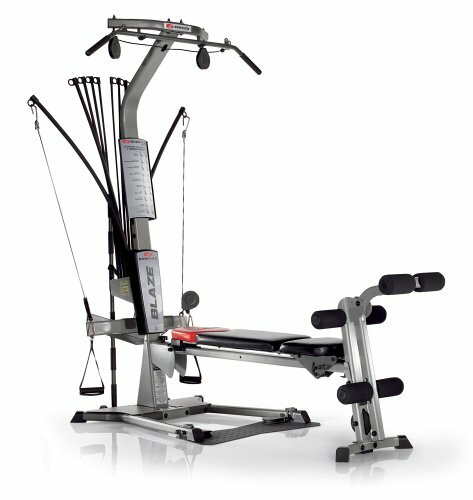 Verdict: The Total Gym XLS is a very popular model that will give you a comprehensive workout that is effective and efficient. The instructional DVDs that accompany this machine plus the included nutritional program ensure that you will be able to lead a healthy lifestyle after purchasing this machine. Make sure that you can afford the monetary investment, however, as it is significantly more expensive than competing models. Also, always be sure to follow the directions carefully for each exercise to avoid any injury. Features: The Bowflex Blaze home gym features the same resistance rod technology that made this brand famous and also provides users with a comprehensive workout featuring more than sixty different exercises. The maximum weight resistance for the machine is 210 pounds, but there is the option to purchase more tense rods that can simulate 310-410 pounds of weight. This product also features a leg extension and leg curl attachment to further add variety to your workout. The Bowflex Blaze home gym is priced at $800 and comes with a five year limited warranty and lifetime warranty on the power rod system. 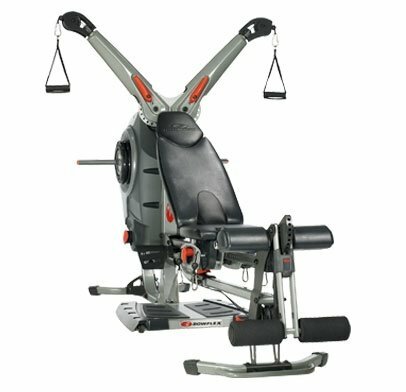 Pros: The warranty on this product is one of the major advantages that the Blaze home gym offers over other Bowflex products. A lifetime warranty on the power rod system is supremely beneficial if they lose resistance over a period of years. Another advantage of this machine is the fact that it comes with instructions to complete a 20 minute total body workout. This will allow you to feel confident that you are obtaining the most efficient and effective workout for your body. Cons: Though there are many advantages to the Bowflex Blaze, there are a few drawbacks as well. One of the drawbacks is the $800 price tag. Other Bowflex models might be more affordable, though they do not offer as many features. Another disadvantage to this product is the fact that some users mentioned the resistance rods not being as customizable as they would prefer. Verdict: Overall, the Bowflex Blaze home gym is a product that is well worth the investment for your fitness needs. It provides over sixty exercises that you can perform for a total body workout and also offers the option to purchase up to 410 pounds of resistance rods. Make sure to assess whether you can afford this product and also keep in mind that the resistance rods don’t offer as small of increments of weight change as plated machines. Features: The Total Gym 1900 features sixty or more exercises including strength, cardio, Pilates, and stretching that come together to form a comprehensive effective workout in a short amount of time. This unit it priced at $389 and contains 12 levels of resistance, a Pilates bar, and an abdominal crunch board. Pros: There are several advantages to purchasing the Total Gym 1900 over other models of home gyms. First of all, this home gym is significantly more affordable than other models. The $389 price tag makes the Total Gym within reach for the average family looking for a healthier lifestyle. Secondly, many customers have commented on the easy set up and assembly of this product. There are no lengthy, confusing instructions to hassle with. Finally, the Total Gym 1900 has the Pilates bar attachment which allows for greater diversity in your workouts. Many home gyms focus simply on strength and cardio, while the Total Gym also incorporates the benefits of stretching into the mix. Cons: One of the noted disadvantages to this machine is that a few customers have mentioned the potential for the rollers to come off of the glide bars for the sliding bench. Additionally some customers noted that it is a little bulky to leave out and might not be realistic to fold up each time you are finished using the product. Make sure that the product fits comfortably in the space that you have designated for it before making your final purchase. Verdict: The Total Gym 1900 is priced reasonably and will truly offer a total body workout to those who invest in it. The addition of a Pilates bar and abdominal crunch board make this the most versatile Total Gym that has hit the market. Keep in mind that the rollers of the sliding bench may come loose and that the product is longer than average due to all of the attachments. Make sure you have ample space for this product in your home before investing your money. Features: The Body Solid EXM1500S single stack is a piece of equipment that utilizes one stack of weighted plates with a variety of attached exercises for you to complete. This model features a lat bar, low row bar, utility strap, and workout poster designed to instruct you how to safely and correctly perform each exercise. 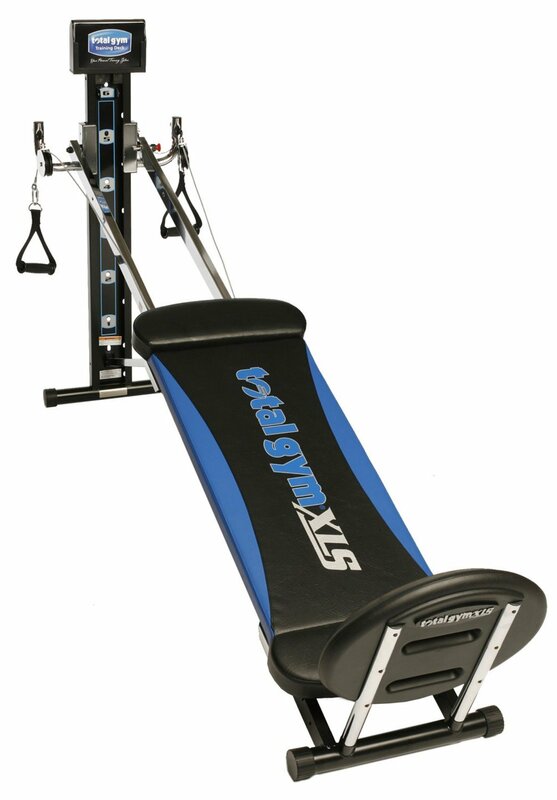 This machine, priced at $887 features a 160 pound maximum weight stack that is adjustable in 10 pound increments. Pros: One of the benefits to this type of machine is the fact that it includes a lifetime limited manufacturer’s warranty. You can feel confident in your purchase of the Body Solid EXM1500S that if there is a malfunction with the product you will get great customer service and a prompt solution to your problem. In addition, the unit is very sturdy and durable. Unlike less expensive home gyms, there is a minimal concern of losing resistance over time or of pieces breaking with heavy use. Cons: The disadvantages to this product focus on the price and limited exercises. For $887, one might expect to receive a workout machine that contains more variety than the six options that Body Solid offers. In addition, some have mentioned that the assembly instructions of the product were confusing and the product arrived in multiple boxes, making the job even more laborious. Verdict: The Body Solid home gym is a durable machine that will last for a long time in your home fitness center. Make sure that you are comfortable with the limited amount of exercises that it offers and also keep in mind that the $887 price tag is a bit steep for its capabilities. In conclusion, purchasing a home gym is an investment that will allow you to work out in the privacy and comfort of your own home. Make sure to assess whether a rod resistance gym, weight stack gym, free weight gym, or body weight gym is the best option for your fitness needs. You should also consider items such as cost, size, maximum weight, and variety of exercises when purchasing. Once you have answered these questions, look for the best model that will suit both your budget and your fitness goals.